Saeko Ogi is a tanka poet and translator who is actively involved in tanka readings. 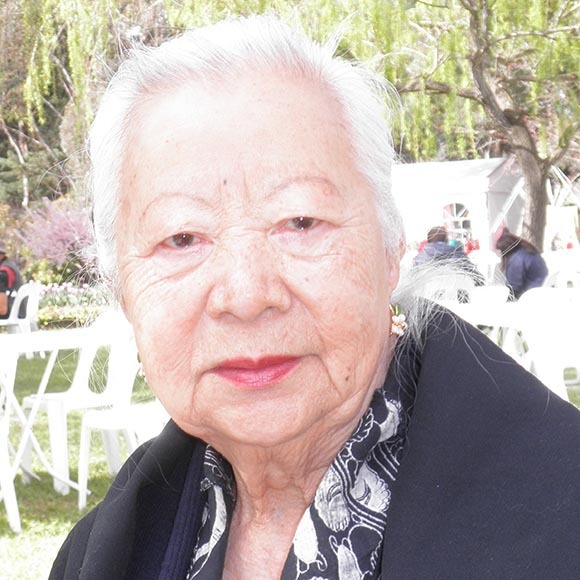 She was born in Tokyo, Japan in 1931 and since 1972 has lived in Canberra, Australia. She facilitates the CJC (Canberra Japan Club) Bluebells Tanka Group that she founded in 2011. Saeko has also been a member of the Araragi-ha Tanka Group in Japan since 2003. Saeko has translated and published an extensive number of Haiku and Tanka in both Japanese and English. Her own published works include ‘機織鳥 Weaver Birds’ (2010) and ‘言問ふ花　Words Flower’ (2011), both bi-lingual anthologies with Amelia Fielden. In 2018, she published ‘Four Poets in a Boat – An Anthology of Contemporary Japanese Tanka’ and ‘POETRY BRIDGES 「うたの架け橋」Canberra/Nara Commemorative Anthology キャンベラ・奈良記念作品集. Also in 2018 she co-translated「ナヅノキ 2018 NADZUNOKI 2018」Tanka Anthology. Saeko Ogi has presented talks on numerous occasions, including at book launchings that have been held in Canberra. At these talks Saeko discusses the traditional form of Japanese poetry and the challenges she faces in translating poetry. She has also attended numerous Tanka Symposiums in Nara in 2010, 2011, 2014 & 2016, where she discussed Australian tanka activities and trends to a Japanese audience. In December 2017, the second anthology of Tanka by poets of the CJC Bluebells Tanka Group was published.